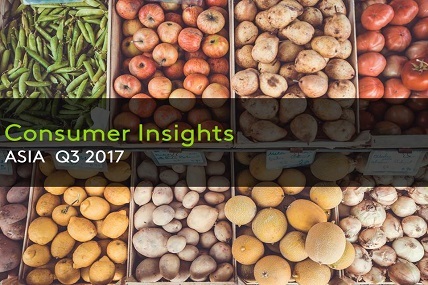 2017 Q3 Asia Consumer Insights report is now available with FMCG trends in a variety of categories in the region, covering China, Indonesia, Korea, Taiwan, Vietnam, Malaysia, Thailand, Philippines, India and Saudi Arabia. *South region in Saudi Arabia is still excluded from this Q3 report as efforts are ongoing to resume data collection. There has been an uptick in FMCG market value growth to 3.4% year-on-year in Q3, compared to 3.3% on the same period last year. Personal care is still the fastest growing sector amongst all, with 7.5% year-on-year growth in Q3, revealing consumer focus on better quality life and self-image/ cleanliness. Food sector registered stronger growth at 3.2% in Q3, led by increased shopper spend as is basic and essential need. imported detergent in Taiwan, is also one of the trend in this sector. Consumers nowadays are seeking for health and active living. Nutritional benefit could be one of the key elements to promote and grow in Dairy sector. Beverage sector continued to slow down to -0.4% in this quarter. More innovation required to spur future growth of the sector.